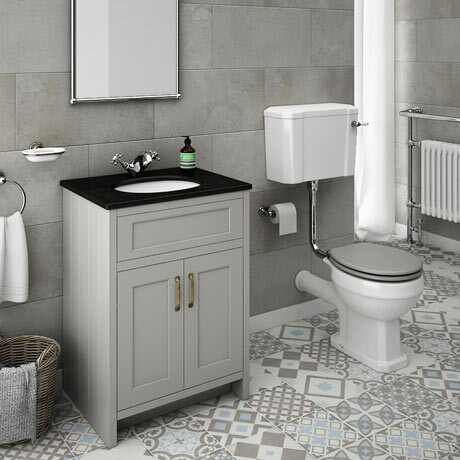 A high-quality traditional bathroom suite featuring a traditional low level toilet and a 610mm wide vanity unit with marble basin top; with it's classic styling has been designed to match the Chatsworth range of bathroom furniture. Victorian inspired design with a modern twist. The Grey Black Marble Vanity unit provides generous storage space for your toiletries, helping to keep your bathroom clutter free. Manufactured to a high standard, the inspired Chatsworth range of luxury furniture with it's clean minimalist design and muted palette blends beautifully with any style of bathroom.